1865 $5 Dollar Bill, what is it Worth? The 1865 $5 dollar bill is probably the most common denomination for the series. 1865 $5.00 dollar bill is the first series of $5 dollar national currency notes printed. There really isn't a 1865 $5 dollar bill but original series notes can have 1865 as the plate date. An 1865 $5 dollar bill on a state like Nevada or Idaho are super rare and very expensive. The highest price I could find was for a Red Oak, Iowa serial #1 that sold for $138k in 2008. 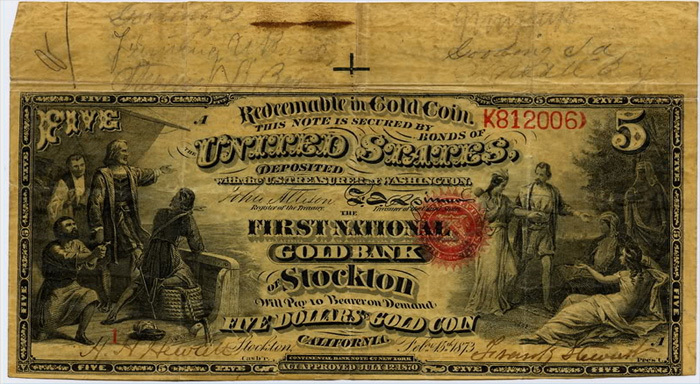 A typical note on a common bank would be worth from $500 to $4000 depending on condition. Below are some examples of the 1865 $5 Dollar Bill. If you have an 1865 $5 dollar bill and want to know what it's worth, contact me. The Following Banks Issued 1865 $5 Dollar Notes.